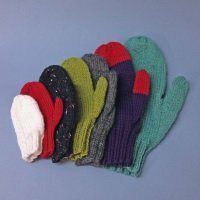 This pattern brings back memories from childhood – mittens drying on the radiator after school recess. This is an easy two needle pattern in worsted weight wool. No left or right so pattern is simple to memorize. Seven sizes provided for small babies to large adults. 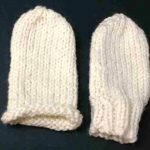 Make three mitts for the children who have a tendency to lose theirs. Or make two consecutive sizes and tuck one inside the other for extra warmth. Variations on a theme section includes an allover lattice pattern and a blank chart so you can design your own.